Excellent graphic! Save this one. It would make a good sign at a public protest. Seen on AR. Click to enlarge. That’s good! So easy a child can understand it. What is the place or value of public protest in the Mindweapon programme? Hell, if you can do it without ruining your livelihood or family life, I think it’d be worth it. Make pro-white and conservative minded people gain confidence. I saw both things happen when I was on my tear in Boston back in 2001-2002. It was a lot of fun, too, and people joined us just because it was fun. I’ll give you one example. We had a human resources director for the city of Framingham, MA at a human rights commission meeting answering questions about affirmative action hiring. we had a guy who knew the statutes on affirmative action verbatim. the HR director admitted to using quotas, our guy quoted the statute prohibiting quotas, the guy says, “I’m off the clock” and starts leaving the room. One of our guys stands up and says, “Why don’t you give up your job and give it to a minority?” He breaks into a run and goes out a side door, slamming it behind him. We’re laughing our asses off, and our big regret is we didn’t have a camera! That would have been youtube gold! We absolutely could still be doing this, and putting it on youtube, and having millions of people laugh at white liberals and discredit them, and get people on our side — if for no other reason than verbally and rhetorically attacking liberals in public is fun, and pretty easy. Liberals are the Unchallenged Establishment — challenging them is unheard of, it’s heresy! They aren’t ready for it, and they flee, and look like the cowardly little shitbirds that they are. I saw a white guy holding an “Impeach Obama” sign in front of the post office last summer. I turned around, parked, and started talking to him. It turns out he was a member of the Larouch group, which of course seeks converts. I didn’t buy into conversion, but I did get a bit of literature. Just the sight of someone holding a sign like that was encouraging. And that was back in the good old days! Now it’s much worse. ‘”Miss Rand” said’? You mean Alice Rosenbaum? Ian Bayne, a Republican politician from Illinois, dealt with the issue by comparing him, cravenly, to Rosa Parks! Not apologizing to Satan is a good start, eh? I think he might be a true believer, though rather unschooled and primitive. But I haven’t known him personally, and haven’t learned much about his life, so far. We need to be very careful about accepting, or rejecting, strangers who might be angels or demons in disguise. Fellowship like charity begins at home. I haven’t even watched the TV show. I despise Talmudvision. I’ve never seen DD either. TV viewing is going way down. Glad to hear that there are still likely some true Christians out there. What is it about Christianity and beards? Most conservative traditional Christians deliberately let them grow, and so the Robertsons do. Some say it looks just like the Hippies, but most Hippies shaved theirs off long ago, while we keep ours. Long hair and full beards might be discouraged or banned by those ‘Mainstreaming’ WNs who strive to become or appear ‘normal’, but we continue to overturn the tables of the ‘fashion industry’ by wearing our plain, practical, even homemade clothing and letting our male facial hair exist, just the way it is, for the glory of God who created it. So I take it you have a beard, Mosin? The message of the cartoon is the classic, “One bad apple spoils the barrel.” Our ancestors knew this, but since apples are not stored in barrels anymore, we’ve forgotten it. 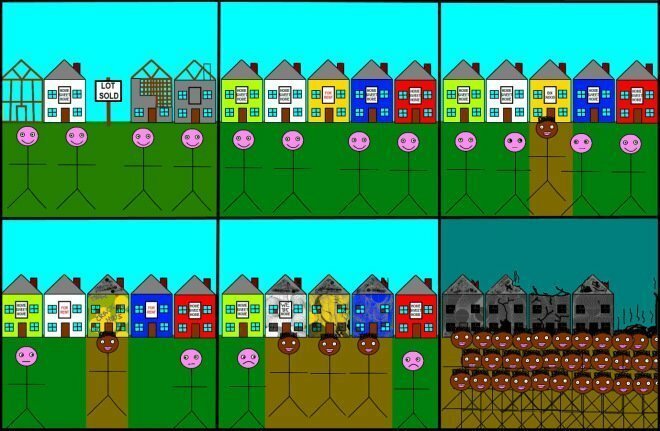 Even one black allowed into a neighborhood can turn it all black within a few years. We have no place to run anymore. Thus, we must stand and fight. Calling the cops everytime a black in your neighborhood spits on the sidewalk is a good place to start. Any other ideas?